Metz & Co, the Amsterdam department store whose wares included Rietveld furniture, asked Rietveld to make a graphic design for the letters ‘Metz & Co’ on the roof. Rietveld enlarged the design brief into one for a pavilion in which to exhibit the new functional furniture in a fitting environment as well as admire the Amsterdam roofscape. The circular glazed display room is carried by a lightweight steel structure; the cupola itself is almost all glass in slender steel frames. 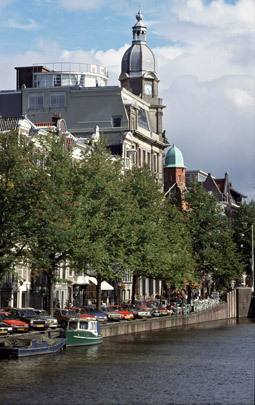 This cupola was renovated in 1986 by Cees Dam but has been closed to the public since 2012, when a fashion chain took over the building.